Step into a world of alien sculptures, where the artists draw on shapes from the natural and supernatural to create work that is all at once thought-provoking and beautiful. 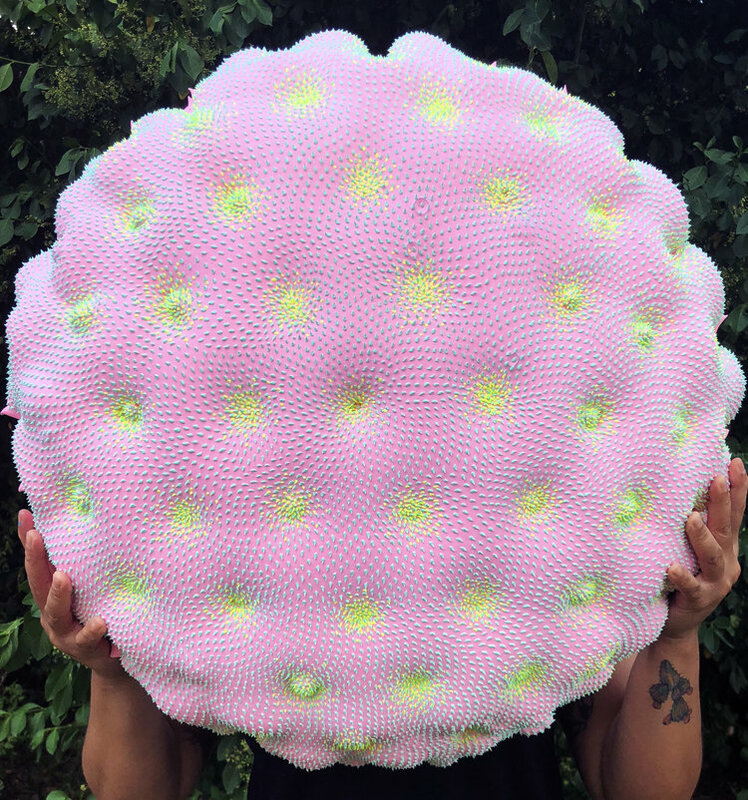 Dan Lam creates brightly coloured sculptures from polyurethane foam, acrylics and art resin, onto which she then meticulously pipes hundreds of spikes. Born in the Philippines to Vietnamese refugee parents, she now lives in Dallas where she creates work that takes cues from nature, food, and the human body. Her sculptures look like amoebas or sea creatures, evoking strange otherworld qualities. Lam’s sculptures address both attraction and repulsion often incorporating layers of crystals and colour-changing, thermal paints to bring the alien works to life. 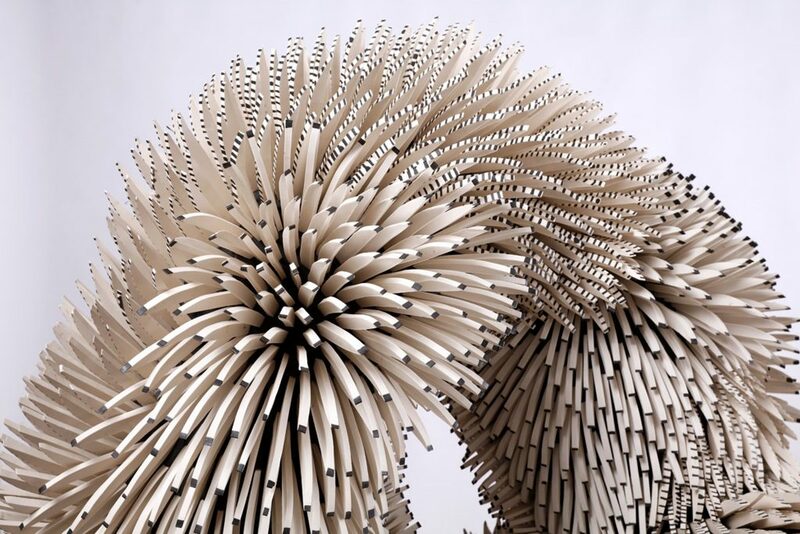 Zemer Peled’s work examines the beauty and brutality of the natural world. She says her sculptural language is informed by her surrounding environment and landscapes and engages with themes of memory, identity and place. Her work also turns the association of porcelain with refinement and civilisation in on itself by breaking it into shards. Using thousands of handcrafted porcelain shards, Israeli-born artist Peled produces large-scale sculptures that are densely textured. The works change depending on what angle they are viewed from – at once looking as if they are made with soft feathers or sharp spines – the pieces reflect the natural world, imitating swirling wind patterns or rolling planes of grass. 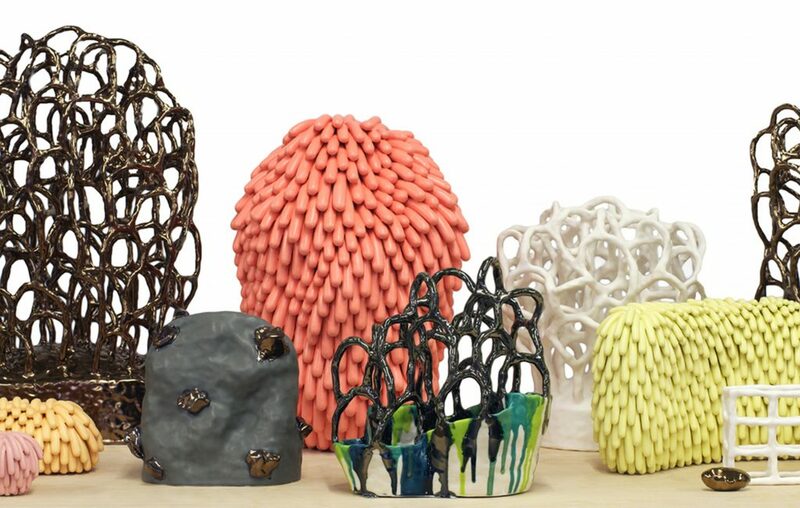 For her show Intermission at Mindy Solomon gallery, Linda Lopez created sculptural vignettes inviting touch and exploration to engage the viewer. In this her second solo exhibition at the gallery, she explored time and space with her assemblages of ‘dust furries, textiles and phantom mounds’. These objects were intended to capture time in an abstracted world, where moments of pause and frenzy co-exist in a delicate balance of past, present and future, said Lopez. Lopez says she resists acknowledging that the objects inhabiting our lives are inanimate and that by considering the objects’ needs and denying our needs for those objects, they can ‘expose life and language of their own’. A stack of books hidden by a blanket of dust waits patiently to fulfill its purpose. The books appear to be aged and desolate yet shielded and protected by time and neglect. By carefully observing the relationships between the things around us, Lopez has found them to reveal their physical and psychological states that often go unnoticed. In this realm, objects are personified, perception is ever-changing, and things become their true self.